With patients' needs at the heart of everything we do, our website has been designed to make it easy for you to gain instant access to the information you need. As well as specific practice details such as opening hours and how to register, you will find a wealth of useful pages covering a wide range of health issues along with links to other relevant medical organisations. Are you over 50? Would you like to talk to someone? Oasis-Talk has teamed up with Carers Support Centre to offer a free talking therapy service. All counsellors are registered and qualified. 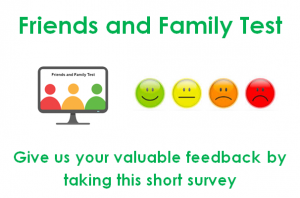 Thank you for taking part - it will help us to understand what we do well and the things we need to improve.